Learn more about the Lorex HD Weatherproof Night Vision Security Dome Camera with pricing, features, and frequently asked questions. 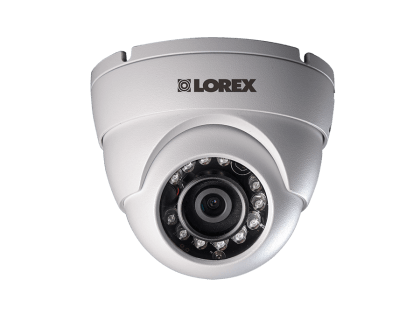 The Lorex HD Weatherproof Night Vision Security Dome Camera is a Lorex security camera for indoor and outdoor use. The camera is equipped with a variety of features, such as night vision and an infrared cut filter. 130 ft. maximum night vision range. Pros: Durable design. Easy to install and adjust. Cons: Can only see up to 90 ft. in total darkness. Bottomline: The Lorex HD Weatherproof Night Vision Security Dome Camera is a dependable product with sharp video quality. 90 - 130 ft. / 28 - 40 m.
What are some alternatives to the Lorex HD Weatherproof Night Vision Security Dome Camera? GW Security 16 Channel 5MP NVR 1920P IP Camera Network. Where can I buy the Lorex HD Weatherproof Night Vision Security Dome Camera? The Lorex HD Weatherproof Night Vision Security Dome Camera is available on Amazon and on the Lorex website. Does the Lorex HD Weatherproof Night Vision Security Dome Camera work at night? The Lorex HD Weatherproof Night Vision Security Dome Camera can see up to 130 ft. in ambient lighting and up to 90 ft. in total darkness. Can the Lorex HD Weatherproof Night Vision Security Dome Camera be used in any weather? The camera is designed to withstand a wide range of weather conditions and temperatures, even in extreme environments.